Home / Amazing / News / Viral / Tinanggalan Ng Balot Ang 'Dinosaur Mummy' Sa Isang Museum Ngunit 'Di Nila Inasahan Ang Kanilang Natuklasan Dito. Tinanggalan Ng Balot Ang 'Dinosaur Mummy' Sa Isang Museum Ngunit 'Di Nila Inasahan Ang Kanilang Natuklasan Dito. A dinosaur is one of the most mysterious creatures on earth, partly because their existence can only be confirmed through fossils and bones preserved in soil. Apart from that, the reason why they were totally wiped out from the planet still remains a mystery up to this day. Can you believe that scientists are still discovering some of their bones, despite the fact that they have disappeared billions of years ago? 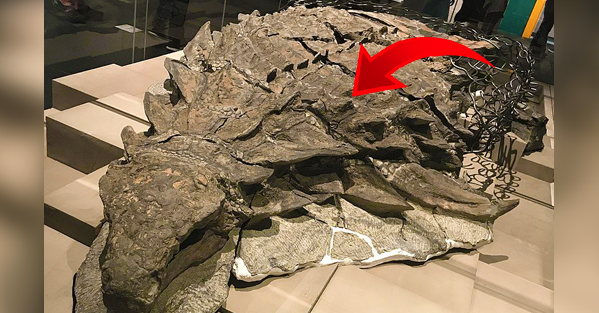 According to NTD Television, experts from Canada discovered a “dinosaur mummy” whose bones were very much well-preserved, which is why the source didn’t refer to it as a fossil. Scientists who found out about it touted it the “best-preserved dinosaur on Earth.” The creature was 18 foot in length. Apparently, the “dinosaur mummy” was first discovered in 2011, when an oil mine employee named Shawn Funk found its bones accidentally during his shift. Researchers studied the bones for six years and around 7,000 hours. They conducted various tests and did preparations to have the bones displayed in the museum. What do you think of this, readers? Are you fascinated with dinosaurs? Were you impressed with this certain “dinosaur mummy?” Let us know your thoughts and opinions in the comments section below!